American Eagle– 40% off of everything + ALL sweaters $25!!! I love American Eagle sweaters. Always have!! They are good quality and always on trend. Here are a few of my fav AE picks. Chenille Sweater– $25. I love the chenille trend!! It is so cute (and soft)! My sister sent me this sweater a few weeks ago- we are both obsessed! It is almost half price today and comes in several other colors. Slouchy Chenille Cardigan– $25. I love this chenille cardigan too!! I am all about the long cardigans this season- they are so nice to have for throwing over any outfit when you are running out the door! This sweater is a good gift option for anyone on your list because cardigans run pretty true to size on everyone. This one comes in pink and a pretty dark gray. Zip-Back Bell Sleeve Sweater– $25. This sweater is so fun and different with the zip up back! You can wear it zipped high with a cropped tank underneath to add a little bit of sass on date night, or wear it zipped past your jeans for a daytime look. It comes in this pretty neon pink and 4 other colors. Soft & Pretty Sweater– $25. The embroidered sleeves on this sweater add a special touch that would make it a great gift option for anyone on your Christmas list! It also comes in purple and gray. Pom Donegal Beanie– $9.57. This beanie is so on trend!! I saw one very similar at a different retailer for almost $60!! Snag this for any of the trendy peeps on your Christmas list! Hi-Rise Tomgirl Jeans– $35. I know, I know… American Eagle jeans.. But trust me, these are SO ADORABLE!! My very fashionable cousin had on the cutest boyfriend jeans the other day, and when she told me they were from American Eagle I was kind of shocked!! Definitely give these jeans a try- you will get so many compliments!! H&M– 30% off everything + FREE SHIPPING (discount applied at checkout & code 9054 for free ship)!!! Don’t forget that H&M typically runs 1 full size small when the sizes are numeric (2,4,6,8…), but when it comes to Small, Medium & Large they are true to size! Checked Cotton Shirt– $14. I saw this exact shirt at H&M last week and it was too cute to pass up so I got it for my sister for Christmas. Sorry SB- I’m terrible at keeping gift secrets!! Grab this for yourself, sister, daughter or friend this Christmas!! It comes in several other colors, but this one is my fav! Knit Wool-Blend Sweater– $11. My sister and I both got one of these sweaters!! It has a boyfriend/slouchy fit and comes in a few different colors. I cannot believe the price for Cyber Monday!! Star Romper– $35. This might not look like much online, but I saw it in stores last week and it is so pretty!! It looks like something that would be $150+ on Revolve or ShopBop!! I’m kicking myself for not trying it on. This would be cute with black tights and boots for dinner, or with some sassy metallic heels for New Years Eve! Pile-Lined Parka– $42. I saw this parka in store last week and I am going to order it today! It is such a good price for the quality!! I love how it is slightly longer in the back to help cover the bum. This parka comes in 5 other colors- even pink!! I might branch out and do a different color- but I just love khaki green!! This would be a great gift for your daughter, sister, mom or yourself. Black Poncho– $20. I am going to order this poncho to wear with black leggings, a long sleeve T shirt + a beanie this winter!! It would also make the perfect gift because it is one size and would be flattering on anyone. Men’s Hooded Sweatshirt Jacket– $14. My boyfriend and brothers all have this sweatshirt! It is so comfy and still looks nice enough for a casual dinner. I love stealing it… Ha, but seriously, this would make a good gift for any guy on your list! It comes in 6 other colors! I can even see my brothers rocking the pink color. Men’s 3 Pack T Shirts– $14. Hello stocking stuffers!!!! What guy doesn’t need more under shirts? These come in a couple other color combos and are great for any of the guys on your list. If your guy is a Panther’s fan he will love this color combo!! Azalea– 25% off of everything with code “25FORALL”!! I love this retailer for Cyber Monday because they carry a ton of great brands that don’t typically go on sale on other sites! Crossbody Mini Bag– $44. This is a great Chloé bag dupe!! I love it for your sister, girlfriend, daughter or mom! Black Lace Top– $37. I have a very similar top that I love to wear with a little black bralette underneath. I always get tons of compliments when I wear it!! I pair mine with a black mini skirt, jeans, or even fake leather leggings! So fun. Get this for yourself or for the sassy fashionista in your life. 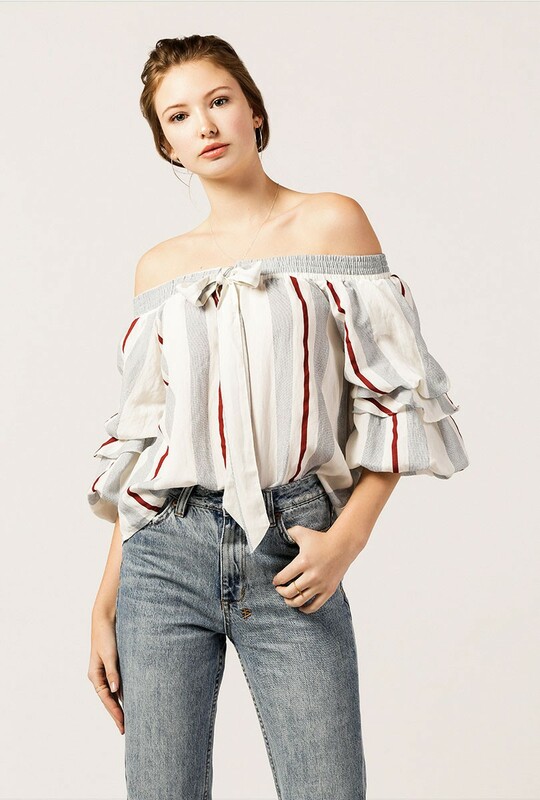 Striped Ruffle OTS Top– $52. This top is a little pricier than some of the other things on this list, but it is so cute and different that I think it’s worth a fun splurge! This would be so cute with the American Eagle girlfriend jeans I posted about earlier. Coffee Is My BFF Insulated Mug– $13.50. This travel mug is the perfect gift for the coffee lover in your life!! The brand is Bando- they make the cutest stuff!! Men’s Herschel Supply Co Novel Duffle Bag– $64. This is an amazing gift for any guy in your life that travels for work or goes from the office to the gym. It looks much nicer than a big gym bag, and it even has a convenient shoe compartment on the side. This duffle bag is typically $85 and rarely goes on sale, so to find it at this price is a great deal! Men’s Herschel Supply Roy Wallet– $19. This is another gift idea for the guy in your life at a great price point! I love the fun design. Order this for your son, boyfriend, or brother and they will think you are SO cool! GILT– Lots of good sales + FREE SHIPPING with code “YAYSHIP”!! My bestie Sabrina first told me about Gilt! We love to order stuff for the home here. They have designer pieces on sale for a short amount of time, and are constantly rotating their sales. 14 Piece Cookware Set by Rachael Ray– $149. Does someone on your list need or ask for new pots and pans? This is a GREAT gift option for them or for yourself! Cusinart 13- Piece Stainless Steel Cutlery Set– $79. If you have a daughter, son, niece, or nephew who just moved into their first new home- this is a great gift idea for them!! It is super sleek looking and a great deal. Safavieh Woven Leather Wood Armchair– $239. These side chairs are very similar to the ones we are doing in our living room at a MUCH better price!! I love the beachy/modern look of these. I have a few things from this brand and I am really impressed with the quality.